Currently riding high at number 2 in the album charts, Amy McDonald is set to become one of the CDs of choice for middle aged couples hosting dinner parties in 2007. Listing her influences as Travis and the Libertines you know she won’t be changing the face of music as we know it, sticking to tried and tested formulae. Thats not to say she’s crap though. Check her out at the following dates, which are all on sale now. PLEASE NOTE: These are dates from 2007. 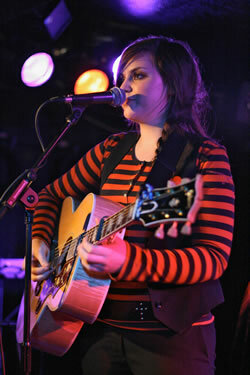 Photo of Amy McDonald at King Tut’s in Glasgow is taken from Potato Junkie’s flickr stream under the Creative Commons License.